Most carpet cleaners in San Antonio not only clean carpet but also tile and grout. However, just because they may excellent carpet cleaners doesn’t mean they are experts at tile and grout cleaning. Some are great at both but most are experts of one or the other. In order to find the right tile and grout cleaning professional you need to research and find out about previous jobs and what their process is. Beyer Carpet Cleaning are expert carpet cleaners as well as tile and grout cleaners, and upholstery cleaners. They have pictures on their website of previous jobs showing the amazing restoration to customers tile and grout. Tile and grout cleaning isn’t easy and can be costly depending on the square footage. 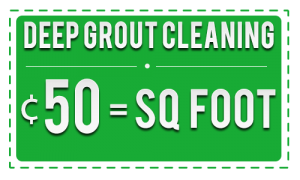 Beyer Carpet Cleaning offers the lowest prices for tile and grout cleaning by only charging $0.50 a square foot (with a $99 minimum) which is well below the average cost of $0.65-$0.75 of most tile and grout cleaners in San Antonio. Beyer puts down an alkaline cleaner and scrubs it into the tile and grout in order to remove any dirt and grime and bring it to the surface. Once the alkaline cleaner has been scrubbed efficiently the technician will steam clean to remove the alkaline, dirt, and grime. 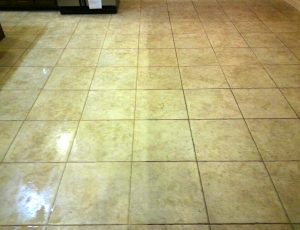 Once the technician is done with the tile and grout cleaning you will be amazed with the results. Grout that was once white will be white again or whatever the original color was. Even tile and grout that hasn’t been cleaned in years can cleaned so that it looks like new again. Beyer Carpet Cleaning doesn’t want to just be expert carpet cleaners they want to be experts in all of your cleaning needs. Beyer trains each technician how to properly preform each cleaning so the customers are happy. From carpet cleaning to tile and grout cleaning to upholstery cleaning Beyer can help you with all your cleaning needs. They are committed to customer satisfaction and offering the best price in San Antonio. If you use Beyer Carpet Cleaning you will not be disappointed only amazed.